The Mahabodhi International Meditation Center stands out as a model of socially engaged Buddhism in India. Perched high in the Himalayas, this vibrant spiritual community consists of a residential school for more than 400 poor children drawn from surrounding villages, an institute for the blind, a home for the aged, a monastery, a nunnery and more. 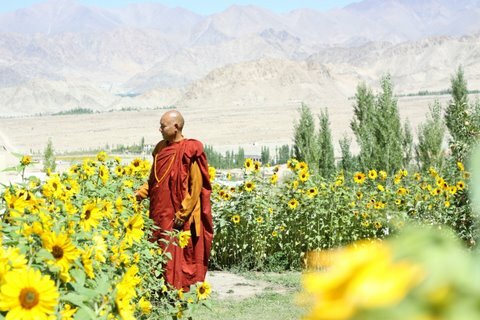 The vision to form a community based on socially engaged Buddhist principles belongs to Venerable Bhikkhu Sanghasena, a Buddhist monk and spiritual leader from India?s northernmost region of Ladakh. He kindly sat down with me to answer some questions about the community. Kiva Bottero: Who inspired you towards this vision of socially engaged Buddhism? Venerable Sanghasena: The Lord Buddha is the main teacher who inspired me. Not exactly in terms of socially engaged Buddhism, but the Buddha inspired me. He was full of compassion. I think many Buddhists do not properly understand the Buddha?s teachings. Many people keep on reciting the Buddha?s teachings of ?love compassion,? ?love compassion,? but those ideals must be brought into action. This is what we are trying to do. One of our slogans is ?Compassion in action, meditation in action.? Not just simply going around sitting in the high seat and talking about compassion without action. We don?t believe that. The Buddha?s teaching is compassion in action. It is meditation in action. That is what we are trying to do. Then, while visiting several countries, I got inspired by some other great people in India like Sathya Sai Baba. He is another wonderful role model. He built the best hospital offering free treatment for the poor. He also offers the best free education for the people, as well as meditation teachings for foreigners. I also met some great masters in Taiwan and Thailand. I got inspiration from many others, but mainly the Buddha. KB: Mahabodhi?s motto states: ?We make the very best use of our time and seize every opportunity to work with diligence for the welfare and happiness of all beings through spiritual and humanitarian services and activities. Thus we consider ourselves to be truly non-sectarian socially engaged Buddhists.? How is socially engaged Buddhism being practiced at Mahabodhi? VS: The Buddha?s teachings are very much socially engaged, but slowly, over the course of time, camps dividing the monastic orders and society developed. With the monks living in monasteries far away from society, lay people didn?t have much contact with them except when going to the temple to seek some blessings, or occasionally when hearing sermons. I feel they have to come closer and work together. Monastics have a distinct role to play, but they have to work together. Unless they come together and work together, the Buddha?s message cannot be spirited effectively among the people. So I saw that clearly, and felt that there is a need for a Buddhist organization where we can reduce the gap. I?m very glad that Mahabodhi has been able to bring these two worlds together. Today, our monks and nuns living on this campus are working very closely with the people while not losing their own distinct identity or their own role as a monk or a nun. KB: How do they work closely with the people? 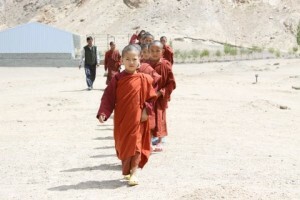 VS: About 400 or 500 are living at Mahobodhi, including monks and nuns. Of course, the number of monks and nuns is very small, but for every activity we come together. For the morning prayer, meditation, or whenever we have activities, we come together and share our experience and ideas together. So this is how we work. KB: When I think of socially engaged Buddhism and Mahabodhi, I tend to think more about the community helping poor villagers by giving them a home, food and schooling than bringing everyone together and living according to the dharma. VS: Helping the poor in the remote villages is one part of socially engaged Buddhism. Socially engaged means engaged in society. Poor people in the village are also part of society. People in the city are also part of society. And here what you are thinking is not wrong; you are right. The children and other underprivileged people ? the elderly, the visually handicapped ? they come from the villages. The people who live on the campus are from more than 65 different villages scattered throughout the mountains. Most come from remote, far-flung areas on the China and Pakistan borders. But we cannot build a school and a campus in every village, nor is it necessary. Our focus right from the beginning has been the poorest of the poor people. The underprivileged people. And then, afterwards, offering yoga and meditation for foreign visitors. Yoga and meditation is not a priority for the poor children. For them the best dharma, the best religion is food. The best dharma for the thirsty is water. The best dharma for the sick is medicine and doctor, not philosophy and guru. The best dharma for the homeless is a home. KB: The Mahabodhi Residential School opened its doors in 1992 with 25 female students and no males. Can you tell me about Mahabodhi?s emphasis on educating women? 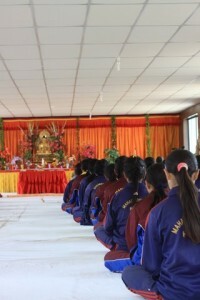 VS: Right from the beginning, Mahabodhi has been emphasizing educating girls. The main reason is that in the history of the world, women have been discriminated against and did not enjoy equal opportunity for education or work. They are always left behind, even today in many parts of the world. Every religion has this kind of belief. Even in Buddhism there is discrimination between monks and nuns. It feels very strange. Even if I find something to that effect in the holy scriptures, I don?t agree. I?m sure the Buddha would agree with me. KB: What role do youth play in the world? VS: Youth are a very important part of society and the world. Today?s youth require proper guidance and inspiration. Many youths are lacking this. Unfortunately, our education system is terrible. Our schools, colleges and universities are not giving the correct guidance to youth. They go to colleges and universities and learn how to develop greed in the name of knowledge and wisdom. We are taught how to go into space and how to work in space without knowing how to live here on this Earth. They do not use the word greed, but they teach greed. So the youth do not have proper guidance, and they get caught up. They don?t know. That?s why so many young people get addicted to drugs and commit suicide. You need guidance, and this guidance comes from spiritual education, not from universities and colleges. KB: Can you tell me about the spiritual education here at Mahabodhi? VS: Unavoidably, children have to acquire the general education, which I personally am not in much favor of, but it cannot be avoided. The whole society is based on this education system. After finishing their studies, students have to get a job and earn something. They will be asked, what?s your qualification, what?s your certificate. For that reason they have to get the general education. Along with that aspect of education, we very much emphasize the moral education, the spiritual education, the meaning and purpose of life. The most important thing is to realize the true nature of existence. The true nature of existence is that we are all temporarily here. We are like visitors, we are like guests. We are not going to live thousands of years. During your visit you cannot afford to spend your time fighting and quarrelling and accumulating more than you need. Once we realize this, then the unnecessary greed, desire, and ego, which are the sources of all problems, will disappear, and our life will be different. We will learn to live a contented life. KB: What are some of the specific differences between the spiritual education a student receives at Mahabodhi and a general education? Through spiritual education, students here learn how to open their hearts toward all of humanity ? not just Buddhists, Indians, and Asians, but open up to all brothers and sisters. We are all sharing the same planet, living under one sun, one moon and one sky. Kiva Bottero works with a collective to publish The Mindful Word journal of engaged living. He also writes and edits material for Dew Media, a company that specializes in providing custom publishing services for non-profits and social enterprises. 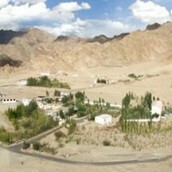 For more information about Mahabodhi visit www.mahabodhi-ladakh.org.